Disclosure/Disclaimer: All posts and ads may contain affiliate links and I will be compensated if you make a purchase after clicking on my links. I received many of the products mentioned in these blog posts for free or at a reduced price in exchange for my honest review. You can read the full disclosure policy by clicking here. All opinions are my own. This blog is written by Sheri Ann Richerson. Any guest posts are clearly marked with the guest authors name! All photos and blog posts are copyright. Do not republish any of the photos or blog posts without written consent. Sharing on social media is fine. Thank you for understanding! I live on a 2 ½ acre organic farm at the edge of the city that is a registered wildlife habitat. Our homestead is also a Monarch Waystation. In addition I participate in the FrogWatch USA program and the Cornell University NestWatch. I did receive my Nest Monitor Certification from Cornell University. We moved to our small 2 1/2 acre homestead in August 2004. Over the years I have learned so much – from raising livestock to canning to surviving without some of the modern day comforts we would have liked to have had. Our home was built in 1935 and heated with wood until recently. During those first winters, the wood floors were icy cold and the house was never over 50 degrees. Sometimes it actually felt warmer in the barn! When it comes to livestock, I have raised horses, Leicester Longwool Sheep, Alpine/Nubian cross dairy goats, Angora goats, Cashmere goats – and of course, crosses between these goats. I have also raised Angora Rabbits, mixed breed rabbits, many different breeds of chickens and turkeys, guineas, phesants, peacocks, Tilapia, catfish, cats and of course dogs. The animals are raised organically and do eat certified organic feed. I make use of the fiber that comes off the livestock by spinning it into yarn or using it on my Union 36 Loom to make rag rugs. I grow a wide variety of herbs, fruits, vegetables, grains and flowers on the farm, using organic methods. I can, dehydrate or freeze the bounty for my own use, sell some of the excess at market and donate some of it to local food pantries or soup kitchens. In addition to traditional soil-based gardening, I also grow hydroponically and have an aquaponic set-up. Welcome to my page – and my life. I am a Renaissance Homesteader who is Learning, Living, Loving Self-Sufficiency! I am also a self proclaimed Plant Geek! And I want to share my knowledge with you – because you never know when life can take an unexpected turn and you might just need self-preservation and survival skills. Sheri Ann Richerson is a leading pioneer in the self-sufficiency movement. For the past 19 years she has been living, teaching, and promoting organic gardening, natural health and self-sufficiency through all forms of media. Her career includes years as a nationally acclaimed best-selling author, radio host and guest on a variety of shows – showcasing her expertise on homesteading and gardening. Additionally, Ms. Richerson is a speaker, columnist and a blogger for hundreds of websites, magazines and newspapers. Her by-lined articles can be found at idiotsguides.com, Parade.com, Learn2Grow.com, Suite101.com, SFGate.com, eHow.com, GardenGuides.com and dozens of other sites. Her farm, Exotic Gardening Farms, is a certified wildlife habitat. She was a Global Warming Ambassador for the National Wildlife Federation, the ReGrow Together Indiana State Coordinator and the Region III Representative for the Plant-A-Row for the Hungry program as well as President of the Grant County Morning Garden Club. Her diverse range of writing gigs has included an eclectic mix of articles on current events, herbs, aromatherapy, tropical plants as well as various pieces on Harley-Davidson motorcycles. Ms. Richerson has given numerous talks on a wide variety of subjects including chocolate, night blooming plants, seed starting, herbs and global warming. Her specialty topic is Theobroma cacao commonly known as chocolate. Ms. Richerson attended Ball State University and Huntington University, where she majored in communications and minored in theatrical arts. Sheri lives in Marion, Indiana. When she isn’t working, she enjoys traveling, following Boy George’s tweets on Twitter, reading, listening to music, weaving and spinning yarn. She also collects Hello Kitty and Raggedy Ann. For more information, please visit her writing website at SheriAnnRicherson.com, her gardening and homesteading website at experimentalhomesteader.com or subscribe to the Experimental Homesteader podcasts on iTunes. Click here to contact Sheri Ann Richerson via email for all questions, comments and potential collaboration opportunities. Growing Plants In What You Have a #1 best seller. 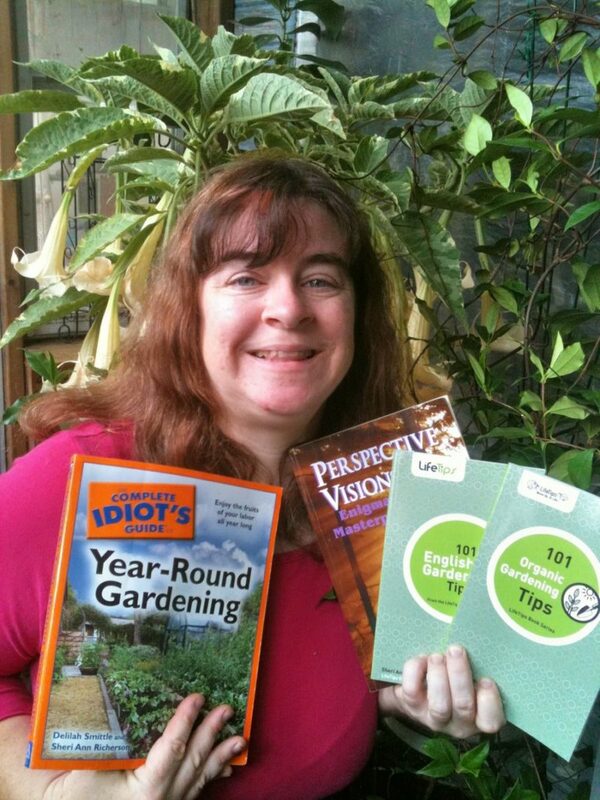 101 Self-Sufficiency Gardening Tips a #1 best seller. 101 Secret Gardening Tips a #1 best seller. The Allure Of Chocolate a #1 best seller. Growing And Harvesting Edible Plants: A Collection Of Articles By Sheri Ann Richerson a #1 best seller. An Herbal Meal For The One You Love a #1 best seller. Houseplants, Cacti And Tropical Plants: A Collection Of Articles By Sheri Ann Richerson a #1 best seller. Herbs For Rock Gardens & Ground Covers a #1 best seller. Magical Gardens a #1 best seller. Herbal Hydroponics a #1 best seller. Wishing Herbs a #1 best seller. 101 Organic Gardening Tips a #1 best seller. Scented Gardens: A Collection Of Articles a #1 best-seller. 101 English Garden Tips a #1 best seller. From Seed To Harvest a #1 best seller. 101 Beginning Gardening Tips a #1 best seller. Fire Magic a #1 best seller. Legend Of Fire a #2 best seller. Healing Properties Of Water a #2 best seller. The Monkey Man Of India: A Figment Of Imagination Or A Fact? a #2 best seller. Ghosts Of Key West a #2 best seller. Natural Health And Wellness: A Collection Of Articles By Sheri Ann Richerson a #3 best seller. Wedding Superstitions a #4 best seller. Urban Legends a #14 best seller. Fairy Dance a #15 best seller. Jervacia’s Last Stand a #19 best seller. Darkness a #28 best seller. Dark Abyss a #34 best seller. Welcome To Your Nightmare a #49 best seller. Instead of having these scattered all over the sidebars of each page of my blog, I decided to add all the widgets on one page. These are sites that I am either an Influencer for or a Contributor too. Interested in cooking, food preservation, natural crafting, gardening and animal husbandry.